Airport Runway Demolition – Surestrike International, Inc. 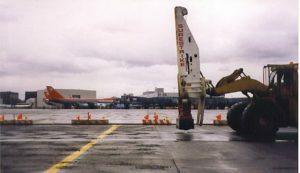 The Surestrike International Inc Model 4000 (SS50) impact hammer mounted to a CAT 988B loader was commissioned for a demolition project to remove the concrete runways at SeaTac airport in Seattle Washington. The contractor onsite found that using the Surestrike impact hammer increased their production in excess of 50%, substantially reduced their costs and improved safety. Just a couple of blows by the Surestrike impact hammer was all that was needed to fracture the concrete into pieces small enough to handle easily. Hydraulic hammers were not used because the flying debris to the nearby airplanes created a safety problem. The contractor had previously used heavy reinforced buckets to break the concrete panels but this proved slow, costly and hard on equipment. The large broken slabs required the use of 2 excavators equipped with thumb attachments to place them into rented “tub” trucks. Using the Surestrike Model 4000 (SS50) broke the 18” thick concrete into smaller, more cubical pieces at a rate of 650 square yards per hour and eliminated the need for one of the excavators and all of the “tub” trucks. The smaller pieces allow for conventional and more available dump trucks to be used and they also experienced less damage to the truck boxes. Potential safety problems of flying debris were eliminated by skirting the Surestrike striking pin area with used belting.